As regular readers will know, I tend to approach Bollywood soundtracks made after 1980 with a fair amount of scepticism. 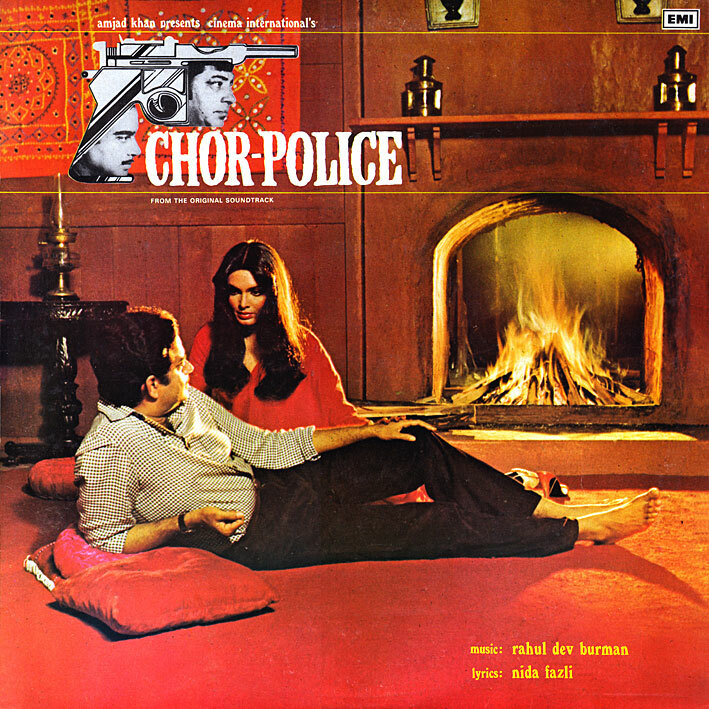 Even RD Burman ones; and that would be my only excuse for not having paid attention to 'Chor-Police' earlier. I should have, because this is a pretty good album. It begins magnificently with 'Aaj Mera Dil', full of bubbly synth sounds, choppy drumming, fantastic breaks, and a partly voice-manipulated Asha Bhosle. The tribal sounding 'Meri Jawani Hai' follows; more synths, more quirky percussion as well as strings feature on this one. Great songs both. Flipping the record over (it's a 45 rpm mini-album) and proceedings take a turn for the lighter... still pleasant though. The chirpy 'Atkan Batkan' sounds like it might have been made for comedic effect (animal noises will do that) or possibly it's a children's song, and both 'Tumse Milke' and 'Tum Kaho' are lovely. One big complaint: They didn't include the film's incredible title music. Damn. great uplaod PC though i have vinyl rip of the same but ur rip is far better. waiting Laxmi Pyare score. Mostly a grand exploration in thr realm of stupendedniss! Hi...any chance to get more pancham album? seriously looking for "Adhoora Aadmi", "Awaara Baap" & "Shiva Ka Insaaf"
Link in the first comment. Although I can't guarantee it still works; this is a pretty old post.